We’ve just come through the busy bliss of the holidays and often times – our bank accounts, nerves, and homes reflect it. With the New Year comes New Year’s Resolutions and one of the famous ones is the resolution to keep a clean home. For some, this can be a daunting and time consuming task and that’s why The Clean Sweep is here to help. In addition to professional help, our housekeepers have crafted a list of things that can help you clean your home one step at a time. Downsize – While Christmas has come and gone, we’re sure that it has left a mess in its path. With new toys, clothes, shoes, and books for each member of the family – rooms can appear to be a bit cluttered. Consider instituting a new post-holiday rule, for every new item received, two items have to go. By implementing this rule, you will cut down on holiday clutter and be able to donate your unwanted items to families in need.Once you’ve finished with gifts – move onto holiday decorations. Were there any decorations that you didn’t use this year? Or do you have any decorations that have been worn down by years of use? Chances are you won’t need them next year. Organize – Divide and conquer! Before you hop to it, dividing your home into sections makes the task much more manageable. Once you’ve decided where to start, take each room one at a time.Here are some general organization tactics that our housekeepers recommend.Label – when you know what’s in boxes, it is much easier to find things and to know where to put items when they are no longer needed. Donate – As you’re going through the house, it is almost guaranteed that you will find some things that are no longer useful or necessary, these items are perfect for donation! Gently worn clothes, toys, and shoes, are perfect items for donation. Throw out – Get rid of items that are no longer useful to you – and that would not be useful for others. If you longer need something, or if it no longer has a place in your home, get rid of it. Set a Schedule – Now that you’ve organized and cleared out clutter, cleaning should be a breeze. When cleaning, clutter is what makes cleaning seem difficult and overwhelming. We recommend starting your organized new year cleaning routine by setting aside an hour multiple days a week to get the job done.For example: Laundry is Monday nights; bathrooms are Saturday morning; trash is Sunday nights, etc. This ensures nothing is overlooked. It also spreads the work out into more manageable chunks of time throughout the week. Great tips, I really like the tips about donating or throwing the things away. It’s so much easier and pretty effective. Great tips here. That graphic also made me laugh! I think the better attitude is that cleaning just needs to be a regular habit, rather than something you dread, put off, then have to work extra hard since it was put off. Awesome…..Important three things …thanks for share. 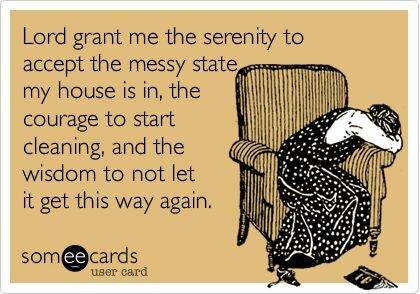 Good tip to handle my messy house. Organizing and de-cluttering always seem to make the house look cleaner without actually having to clean. Good advice. These 3 tips are fantastic! I am a fairly clean and organized person but there is definitely room for improvement. I can’t wait to put this advice to use and see where it gets me! Great ideas for organizing your cleaning strategy. As with any large project, the key is to break it into small manageable pieces. Then it’s not so daunting. Hi CLEANINGPROZ, this is nice article, I enjoyed it. Thank you for sharing !